Vicki has lived and worked in the Arctic since the mid-1990s. 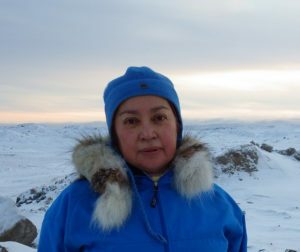 Her efforts in Arctic environmental and wildlife research, have taken her from the Canada-Alaska border east to Baffin Island and north to Ellesmere Island, including 7 Arctic national parks. Her Ph.D. research was on polar bear sea ice habitat, movements, and climate change. She has and continues to work with indigenous people incorporating their traditional knowledge in management and research. She loves snow and ice, which makes the Arctic the best place for her to live with its wonderfully long (7 month) ski season and fascinating sea ice ecosystems.